Maybe you’re in search of the best party capital or want somewhere to relax before the big day. Either way, this list will provide a little inspiration for a world-class hen party. The following locations are the top hen do destinations for 2018, according to hen party experts Chillisauce. As one of the most culturally diverse cities in the UK, Brighton is a favourite amongst many hen parties. Just one hour away from London on the train, this trendy and chic city is the ideal choice for anyone looking to plan a unique hen weekend. In a quintessentially British affair, spend the morning exploring the beach or one of the many bars that surround it! And, when the sun goes down, this colourful city comes alive. Head to the North Laines for a great night out with a friendly atmosphere. Alternatively, visit West Street or one of the big name clubs to continue your hen party into the early hours. If you’re planning a summer hen weekend away, then it doesn’t get much better than Brighton. Book a Brighton life drawing class. With a fantastic choice of places to stay and things to do, Bristol is often dubbed the unofficial capital of the South West. While it may not have occured to you to head there for a hen party, it should definitely be one one of your choices and we have a variety of activities to make this one hen weekend that won’t be forgotten. Famous for its vibrant music scene and cultural street art, trendy Bristol has a lot to offer including some of the best bars and clubs around, a classy harbourside to enjoy a glass of vino and loads of haunts to sip a local cider! Book a Bristol life drawing class. It’s not Scotland’s capital city for any old reason. 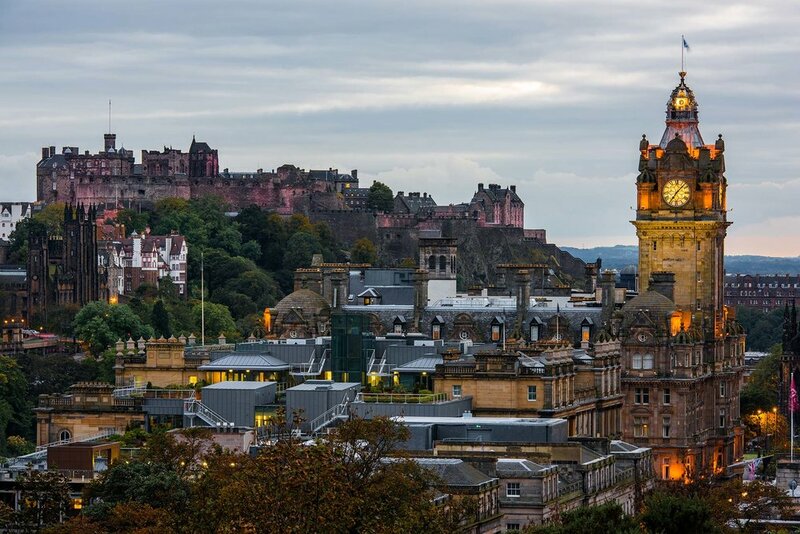 Packed full of bars, clubs, restaurants and activities, Edinburgh is split up into 5 distinct areas so all you have to do is pick your spot and enjoy. Attractive, fun and bustling with Scottish charm, this is one city that certainly knows how to party. The perfect mix of traditional and contemporary, this compact and easy to navigate city is ideal for when the whole hen party has had one too many. But, will anyone be able to stomach haggis the morning after? Renowned for its shops, bars and brows - what more could a girl want? Previously awarded the European Capital of Culture award, this northern UK city has everything you need for an unforgettable hen weekend. A popular destination amongst hens of all ages, you can expect fantastic food, a variety of activities and an amazing music and nightlife scene - after all, it is the home of the Beatles. With over 200 bars and restaurants to visit, why not organise a bar crawl, starting at the beautiful Albert Dock, working your way to Nation and ending up at the Cavern Club. A city with this much musical history is the perfect location for a hen party dance off! Whether you want a traditional hen party weekend (life drawing included), a spa day retreat or are looking for something alternative, London has plenty of activities to impress you. Head to Oxford Street and indulge in a little shopping. Then descend on one of the chicest bars that the capital has to offer. From Soho to Covent Garden, Chelsea to Southbank, whatever your budget or style, this is one destination that everyone will love. Book a London life drawing class. Wales’ capital may be home to numerous bars and clubs but the city is still small enough to get around in your heels - depending how many inches you go for. With one of the best nightlife scenes, Cardiff also boasts one of the biggest shopping centres in the UK so you can nurse your hangover with a little retail therapy. Spend your day doing one of our many group activities and then head down to St Mary’s Street or Park Street and get the fizz flowing. Nights out and Newcastle go hand in hand like a cold gin and tonic. After all, the geordies are famous for their antics on the toon. From the well-loved Quayside to the trendy Diamond strip, this northern city really does have the whole package. Think cocktail classes, shopping sprees and the chance to see some great live music, this is one hen party destination that doesn’t sleep. The locals here are passionate and love a good night out, and have we mentioned the northern drink prices? A city fuelled with great music, an unrivalled clubbing scene and never-ending shopping streets, Manchester is fun, vibrant and brimming with hen party ideas. Choose the glamorous Spinningfields for a-list drinks, try one of the many eateries found in the city centre and then party until the early hours in trendy Deansgate. Alternatively, head to Northern Quarter for endless fun in one of the city’s most popular spots. And for a truly unforgettable evening, head to the skybar and make a toast with panoramic views of the city. Book a Manchester life drawing class. The second largest city in the UK is home to incredible nightlife, mouthwatering restaurants and every shop that a girl could ask for! Birmingham is big on fun. Located in the heart of the midlands, this city is easily accessible for hens all around the UK and with more canals than Venice, this is one hen party destination that is a true all-rounder. As one of the UK’s best beach destinations, in the past few years, Bournemouth has been leading the way as one of the best locations for hen parties. With endless beaches and a variety of restaurants and bars, it’s a little slice of the Mediterranean on home soil. Spend the day exploring the boutique lined streets before hitting the town in one of the award-winning clubs. And, if you’re feeling brave, Bournemouth is all about watersports so why not mix things up a little? This is just a snippet of the information we have available for the top hen party locations in the UK. Do not hesitate to contact us for any more information on destinations or booking a life drawing class in one of the locations above!